KLogicalDrives is a simple, light and free software to retrieve informations on logical drives and has also standard Windows options to manage them (rename, clean, search on, format and so on....). It displays, for each logical drive detected, the size (total capacity, used, free), the serial number, file system, max of file length supported, and if it's the system drive. 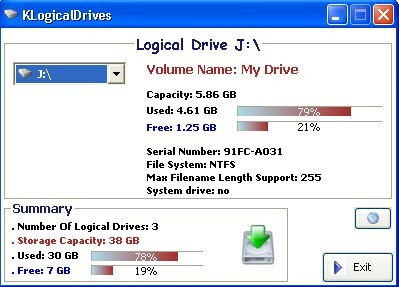 KLogicalDrives is easy to use: simply select a drive ! The software offers also possibilities to empty recycle bin, copy informations to clipboard, save informations in a text file and to take screen shots. Informations are refreshed each time you select a drive. They can be manually refreshed (Press "F5"). Transparent window is supported.